London (Excel, Hall/Stand: B250) – November 25th, 2016: The way students learn and educators teach is changing at an unprecedented pace, with 49% of educators believing the foreseeable future will bring significant changes to the way they teach*. The learning environment has moved beyond a dedicated physical space and is more interactive and social than ever before, with educators increasingly taking on a facilitator role. With this in mind, Sony will be showcasing solutions at Bett 2017 that enable educational institutions to create and present engaging content that inspires students to work collaboratively both on and off campus. 81% of educators believe that e-learning is becoming more popular, so combining the e-learning environment with the real world environment is a growing trend moving forward into 2017*. With this in mind, Sony will be displaying lecture capture solutions, high quality cameras and BRAVIA Professional Displays. From watching videos, to sharing images, to voicing opinions, students are used to being entertained online. So when it comes to sparking their interest – and keeping their attention – it takes more than one-way dialogue from lecturers to make a connection. Sony’s new collaboration solution has been developed to help educators make greater use of active learning methods. It provides the ability to share multimedia like videos, presentations and web content, and quickly connect from mobile devices or USB –sharing it live, and saving it to digital and social channels for review at any time. This tool enables collaboration between multiple groups in a classroom environment, as students and teachers can share content sources, allowing them to discuss their work on a main screen in front of the class. Many institutions (72%) use social media platforms to engage with students and alumni and are looking to stream lectures and content over online forums to increase accessibility**. Sony’s SRG cameras allow educators to bring remote participants into sessions by recording lectures and plenary events to make them available online later. Touch-based solutions combined with the TDM digital signage software available for Sony professional displays, give lecturers the tools to blend engaging content with personable insight. By giving students the opportunity to get hands-on with a 4K professional display, they can boost content where it matters most – like medical and engineering courses. With the digitisation of classrooms, the management and preservation of all materials collected become a high priority to be protected for the long term. Sony’s Optical Disc Archive (ODA) provides excellent data archiving and asset management. It is easily scalable and provides educational institutions safe long-term storage for all their digital assets while keeping archiving costs low. Digitising older assets can be a challenge too but Memnon from Sony is a trusted provider of a range of services to digitise, restore, preserve and provide access to any older recordings. Sony works closely with its customers to understand their needs, which allows the company to build customer feedback into the design process and develop solutions that address the real needs of the education market. Sony offers one point of contact to customers and supports them every step of the way. Starting with incremental changes to existing infrastructure, and moving towards integrating new and existing technology and processes to future-proof educational institutions. 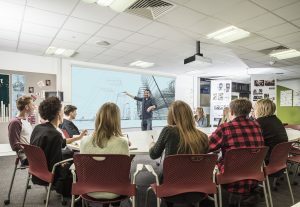 The University of Bath, for example, has worked with Sony to do just this, by installing six VPL-FH500L, and 51 VPL-FH31 3LCD projectors to enable the teachers and students to get the best possible and most engaging experience.